The humble golf ball is actually a vital piece of equipment that is often neglected. Below we review some of the best golf balls on the market. One of the biggest mistakes an amateur can make is not choosing the proper ball that matches their swing.They can spend thousands to be fitted for clubs, choosing the proper shaft, and whether graphite or steel works best for them but one lousy decision on playing the wrong ball can ruin all of the expense and effort. Now you may be saying to yourself, “Well that’s a bit dramatic, no?” But nothing could be farther from the truth. Golf companies have spent millions crafting the perfect ball that fits your profile but if you don’t match yourself to that specific golf ball then you are missing the opportunity to turn that 90 into an 85. What’s the best golf ball for me? Modern day golf balls have been engineered to enhance two things: speed and distance. In combination with those two features many golfers want to “feel” the golf ball upon strike. So choosing the right ball based on your intangibles may not be enough. You may find yourself trying several different brands before settling on the right ball for you. 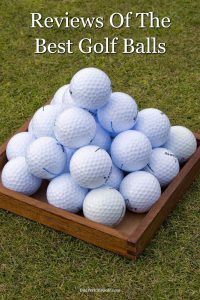 But it’s extremely important to start in the right place and that’s here in this review of the best golf balls for the money. Widely regarded as the number one golf ball on the PGA Tour, the Titleist Pro V1 earns its reputation. This year’s model of the Pro V1 features a redesigned dimple pattern in an effort to reduce spin. Why would a ball maker try to reduce spin? Well for the weekend warrior less spin equals straighter shots. If you are a low handicapper that has confidence in shaping your shots then the V1’s counterpart, the Pro V1x is the golf ball for you. The V1x encourages more spin which allows for more shot control. This is why the V1x is the model preferred by PGA Tour players. For those wondering how the V1 plays around the greens, rest assured that the softness associated with the Titlest V1 series is still providing the true rolls you expect on those birdie putts. Off the tee the Pro V1 does fly lower than the V1x, but again with a reduced spin rate you should expect straighter shots into the fairway. Running at under $50 a dozen, the new Pro V1 can dramatically shave the strokes when you find yourself ready for the challenge. The next ball on our list shares the features similar to the Pro V1 and V1x. The Callaway Chrome Soft series has a regular edition that features a softer feel, straighter ball flight and optimum speed off the tee. For those looking for more adaptability, then the Chrome Soft X model is the one for you. If there is a difference that distinguishes the new version of the Chrome Soft series from previous years it is that the ball is firmer. A firmer golf ball flies farther on contact but there will be noticeably more side spin and less control. That doesn’t mean the Chrome Soft isn’t right for the mid-to-high handicapper. It offers a tremendous upgrade to those who have been playing lower grade golf balls. Bridgestone is the most underrated golf ball maker on the market today. With Titlest and Calloway getting most of the attention, Bridgestone has been making quality, affordable golf balls that represent some of the best value for the amateur today. But with the company signing Tiger Woods to promote and play their golf balls, Bridgestone is ready to enter the lion’s den. Their first big announcement with Woods as a spokesperson was a total redesign of their beloved e Series. Gone are the e5 and e7 models and in their place Bridgestone has introduced the e6 Soft and e6 Speed models. In the e6 Soft, golfers can find the same high quality ball Bridgestone is known for with a more personalized feel. For the golfer looking for greater feel and a softer play on approach shots, the e6 Soft is the ball for your bag. The e6 Speed, on the other hand, is pure muscle. For those looking for maximum distance with reduced spin then this is the model for you. TaylorMade’s entry into the tour ball market is the TP5 model. All the quality you expect from a TaylorMade product is here. The TP5 is for those looking for an entry into the more expensive, higher quality tier of golf balls. All the features for a ball in the $40-to-$50-a-dozen range are here. This five-layer ball has outer layers designed for optimum feel around the greens and an inner core that maximizes distance and provides for a lower spin, lower flight shot path. For those looking for more shot making capability in their golf ball, TaylorMade offers a TP5x version that will increase height on shots and offer more spin for creativity around the green. Another overlooked company in the golf ball game is Srixon. For those with high swing speeds, then Srixon offers a golf ball series that is catered for you. The Z Star series offers two clear cut options. The first is the Z Star model. It is designed for those with 90-mph swings looking to reach their potential in distance. The Z Star series also features a unique “speed dimple” cover that helps the ball on days where the wind is a problem allowing for steady, repeatable ball flight. For those with tour-like swing speed and a need for more adaptability, then the Z Star XV is for you. Maximized for distance, the XV model offers a softer cover that gives the golfer more options around the green. Greater spin on the golf ball allows the golfer the freedom to hit balls where they want and expect the additional backspin to stop the ball closer to the hole. With either Z Star model, the strong golfer can expect shorter approach shots into the green and truer ball flight. We’ve looked at some of the best golf balls on the market. Try each of them out and see which is the best ball for you. You can expect to see an improvement in your game and your scores when you use the right ball.